I subscribe to Christianity Today and in their most recent issue (Nov. 2015, Vol. 59, Num. 9) they have an article by Douglas Groothuis, a well-known professor and author of theology and philosophy with the title “When Islands of Meaning Sink Beneath Us.” (pp. 50-55) The title alone lifted my spirits, but the contents are pure gold. Groothuis’ wife was diagnosed with fibromyalgia over twenty-five years ago and that was only the beginning of her struggles. More recently she was diagnosed with an aggressive, incurable, and terminal form of dementia. Groothuis’ article attempts to make sense of this suffering – the suffering of his wife and his suffering. 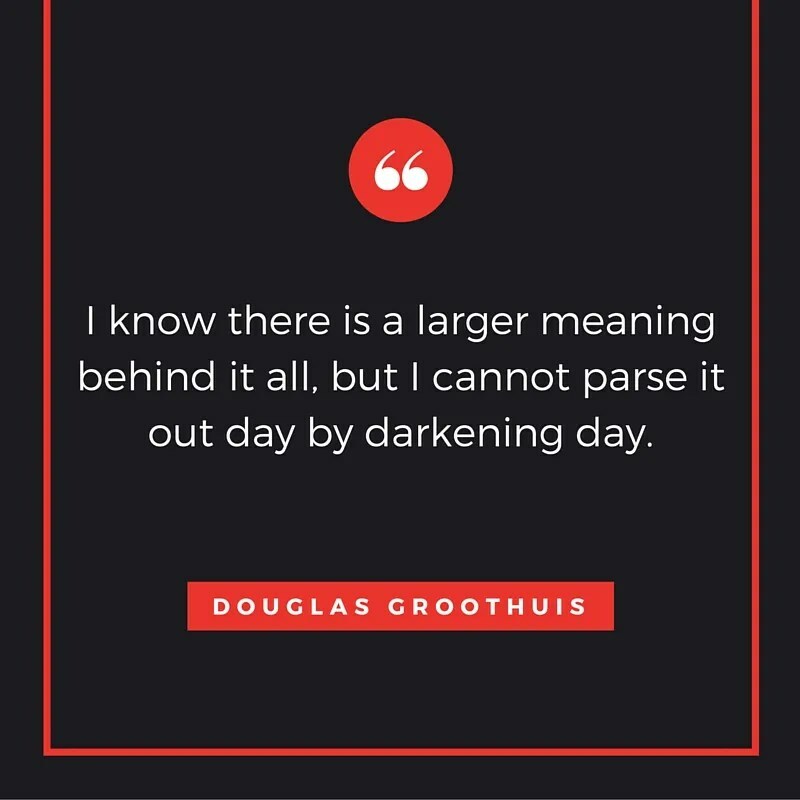 A quote by Douglas Groothuis found in the article “When Islands of Meaning Sink Beneath Us” in Christianity Today, November 2015. And yet, paradoxically, it is Groothuis’ failure which also causes him to succeed in making sense of suffering. Groothuis writes, “Ecclesiastes tells me to embrace my ignorance within the larger circle of knowledge–to mine meaning where I can and to look ahead with hope.” (pg. 55) Groothuis seeks the answer while also accepting the lack of an answer. It is in this tension, this refusal to settle for simple answers, that we find our closest answer to suffering. Tagged dementia, douglas groothuis, ecclesiastes, fibromyalgia, hopeless, psalms of lament, suffering. « My Soul is Weary.